DragSleevz increase drag while maintaining body position and rhythm. They are similar to DragSox but designed for the arms: where DragSox build strength in the legs, Dragsleevz build upper body strength for a more powerful and efficient pull. DragSleevz feature AquaVolo mesh, a symmetrical design, and tubing on both ends to ensure correct body position. 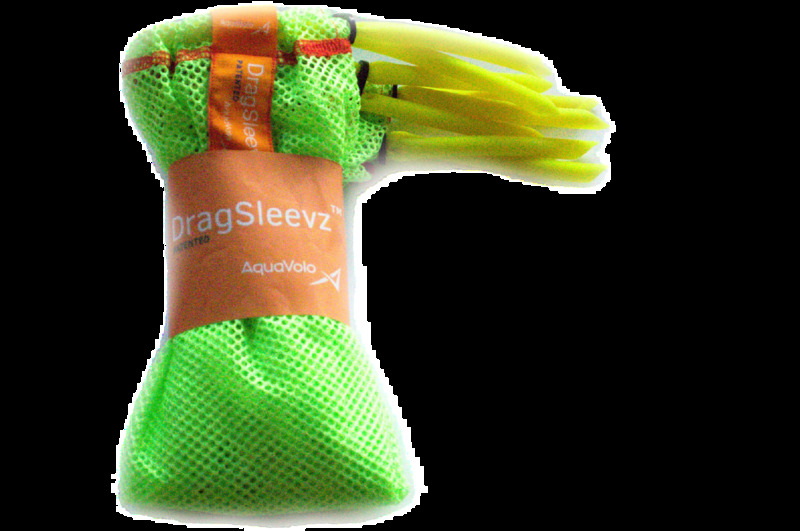 We were inspired to create DragSleevz by coaches who had been using DragSox on their arms. Because DragSox were designed to flow after the swimmer, when worn on the arms, they tended to roll up during the arm entry and push offs, affecting rhythm. While we love the innovations our users bring, we wanted to provide a product that could maintain arm technique while increasing strength--and DragSleevz were born. What is the purpose of DragSleevz? 1. Generate resistance while maintaining body position. By overcoming the extra resistance, the swimmer becomes stronger and more powerful. 2. Sensory stimulation which leads to enhanced feel for water with your arms. How do I use DragSleevz? Pull the DragSleevz on each arm, all the way up to your shoulders just like you would a shirt sleeve. Adjust the tubing just below the shoulder and around each wrist. (You do not have to readjust to remove; once it's adjusted, you can continue to use.) Hit the water! We recommend starting with short distances up to a 100 and alternating sets with DragSleevz on and off. Breaststrokers can also use them on the legs: pull DragSleevz to the knee and adjust the tubing around the ankles. You can use DragSleevz in combination with DragSox and Sensory Mitts to get a full body workout.